Seasonal cuisine served in a magical Parisian hôtel particulier. 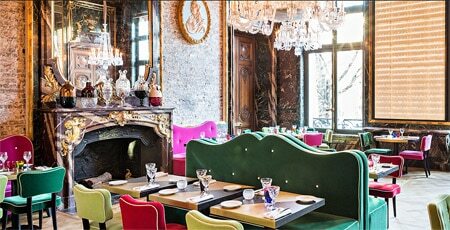 : In a magical Parisian hôtel particulier, redecorated by designer Philippe Starck, and painter Gérard Garouste, chef Guy Martin, owner of Le Grand Véfour, supervises the fare prepared by David Angelot. Made with the freshest ingredients are the trout fillet lacquered in oxalis and seasoned with tofu, roasted veal chop from Corrèze served with small sweet peppers and gnocchis, and crispy chocolate puff pastries with cherries and kirsch ice cream.